Information about Cedar Brake Park in historic Montgomery, Texas and details about "The Pioneers of Montgomery" sculpture and historical monument planned for Cedar Brake Park. Support the Pioneers of Montgomery monument project by buying a brick to memorialize your family, an ancestor, an historic event or significant date, etc. Profits will go toward the monument project and the bricks will be placed in Cedar Brake Park in historic Montgomery, Texas. The history of Cedar Brake Park in historic Montgomery, Texas. Photographs of the Pioneers of Montgomery Project. 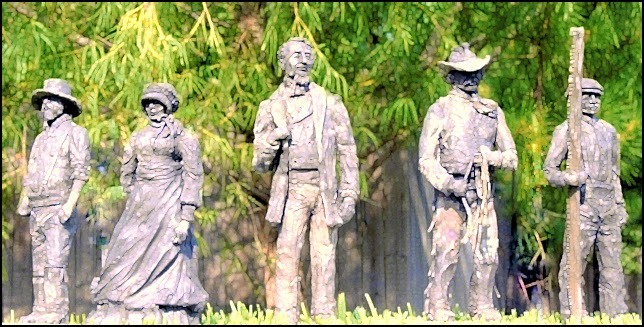 Dedication of the first of five statues in the Pioneers of Montgomery Monument Project in Montogmery, Texas on January 25, 2014. News about Cedar Brake Park in Montgomery, Texas and "The Pioneers of Montgomery" monument sculpture project. Contact information of Patrons of Cedar Brake Park the organization that supports the development and improvement of Cedar Brake Park located in Montgomery, Texas. Download and print a free copy of The Early History of Montgomery, Texas written by Kameron Searle.